Wuxi Gold Control Technology Co., Ltd founded in 1992s., a private high-tech manufactory, is specialized in the research and production of PCB mounting SSRs, AC/DC Solid State Relay, three phase SSR, SSR with heat sink, industrial switch & fan speed controller, power Electronic Semiconductors & thyristor module, voltage regulation controllers, intelligent temperature controller, etc. Most products have passed quality certification, like NSF, UL, CE, CUL, or RoSH. Our different types can meet you all requirements and can be equivalent for what you’ve used before. We are professional to produce PCB mounting SSR and AC/DC SSR. The solid state relay (SSR) are a series of single-pole, normally open, solid state switching devices with no moving parts, capable of tens of millions of cycles of operation. The AC/DC SSR is designed to control 120V, 240V or 480V (up to 660V) alternating current (VAC), and provides zero voltage switching and 2500VAC isolation between the load terminals and the control signal. The control signal causes the SSR to switch the AC load ON or OFF just as a conventional mechanical contact switch does, but with none of the problems associated with moving contact relays, such as corrosion, pitting, arcing, radio frequency interference (RFI) and bounce. 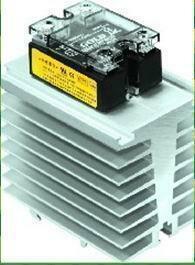 In this way, it can prolong the life span of AC/DC Solid State Relay. It is designed around a pair of SCR's mounted on a heat-spreading metal base to eliminate thermal fatigue failures. To dissipate the heat developed naturally in SSR due to a nominal voltage drop across the device, it must be mounted on a Finned Heat Sink (FHS), or on a metal plate of adequate size. It is advisable to install AC/DC SSR where the ambient temperature is relatively low because its current-switching rating is decreased as its temperature increases. Control resistance heaters up to 40 kW use SSR in conjunction with lower-rated temperature controllers. Three-phase loads can be controlled using 2 or 3 SSRs. 3 SSRs are used for Y-phase loads with a neutral line. It can also used when there is no neutral load to provide redundancy and extra assurance of control. 2 SSRs will control "delta" loads.